The Manx has existed for many centuries on the Isle of Man, located in the Irish Sea between England and Ireland. Since the Isle did not have an indigenous feline species from which the Manx could develop, it is surmised that domestic cats were introduced by human settlers and explorers. Exactly who and when is uncertain. One story has it that the cats were aboard a ship of the Spanish Armada that was wrecked on the Isle of Man in 1588. The resourceful cats supposedly swam ashore at Spanish Point and set up mousekeeping on the Isle. Another story claims that the Manx was introduced by Phoenician traders who transported the cats from Japan. Still another says that cats arrived with the Viking settlers who colonized the Isle of Man. Regardless of how cats got on the Isle, they presumably arrived with their tails intact. Geneticists believe that the Manx’s taillessness is the result of a spontaneous mutation within the Isle’s domestic cat population. Genetically, the Manx and other short-tailed domestic felines are quite different. 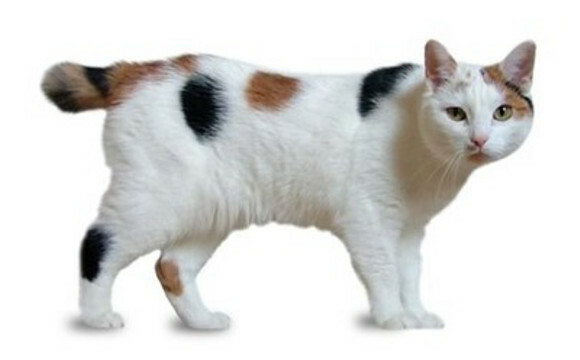 The Manx’s tail, or lack thereof, is governed by a dominant gene along with modifying polygenes, while most other short-tailed breeds, such as the Japanese Bobtail, are governed by recessive genes. Given the Isle’s closed environment and small gene pool, the dominant gene easily passed from one generation to the next. Inhabitants of the Isle, unaware of or unimpressed by boring scientific theory, invented more interesting tales to account for the Manx’s lack. One contends that the Manx is an unlikely cross between a cat and a rabbit. Another claim is that Irish invaders stole the cats? Tails to use for their helmet plumes. A third says two Manx cats were passengers on Noah’s Ark, but as they were the last to board Noah slammed the door on their tails! The modern history of the Manx is better documented, if more mundane. The Manx was a well-established and popular breed before the earliest days of the cat fancy, supported by an enthusiastic group of Manx owners. King Edward VIII was reportedly a Manx fancier and often attended cat shows featuring the breed. British fanciers formed the first Manx club in 1901. The Manx made its journey to America at least 100 years ago (probably longer), and Manx cats are noted in early American cat registry records. Manx cats were at first exported from the Isle of Man but, as the demand grew, the supply waned. Fanciers had to rely on British and American sources for their cats and, since Manx cats are difficult to breed, demand exceeded supply. Today, show-quality Manx cats are in great demand because of their rarity, but pet quality can be obtained quite easily. The Manx’s personality is probably the reason the breed has won such a strong following despite the physical difficulties and breeding challenges. Manx cats make great household companions. They are intelligent, active, and fun-loving cats that manage to express themselves very well without tails to swish around. Manx get along well with other pets (particularly dogs), and form strong bonds with their chosen humans. They enjoy a good game of fetch and are fascinated by water but only on their terms, of course. Manx are exceptional jumpers because of their powerful back legs. No cupboard or shelf is safe with a Manx around. The Manx is known for its unusual rabbit like gait, known as the “Manx hop” While some breeders and fanciers consider the walk to be a result of skeletal abnormalities related to the Manx gene, others consider it merely a result of the short back and the long hind legs as noted in the Manx standard. The Manx is one of the most challenging cats to breed because of the Manx gene. Homozygous Manx kittens (kittens that inherit the Manx gene from both parents) die in vivo early in their development. Since homozygous kittens comprise roughly one quarter of kittens conceived from Manx to Manx matings, Manx litters are generally small, averaging two, three, or four kittens. Even the heterozygous kittens (kittens that inherit the Manx gene from one parent) have a higher than average mortality rate, because the Manx gene can cause deformities such as spina bifida, fusions of the spine, and defects of the colon. Because of the possible physical problems, the Manx standard calls for disqualification of any cat with congenital deformities. Careful breeding can help eliminate or minimize the defects. Since all Manx cats possess only one copy of the Manx gene and since heterozygous cats cannot breed true, Manx cats come in a wide variety of tail lengths. The tail types are broken into four classifications: rumpy, rumpy-riser, stumpy, and longy. Rumpies compete in the championship show ring and are highly prized by fanciers. They are completely tailless and often have a dimple at the base of the spine where the tail would be if it were present. Rumpy-risers have a short knob of tail that consists of one to three vertebrae connected to the last bone of the spine, and are allowable in the show ring as long as the vertical rise of the bones does not stop the judge’s hand when stroked down the cat’s rump (judges are allowed to examine a cat’s tail with the palm of the hand only). Stumpies have a short tail stump that is often curved or kinked. In the CFA, Manx cats with a definite, visible tail joint are transferred to the Any Other Variety class. Longies have tails that are almost as long as an average cat’s. Many breeders dock the tails of these pet-quality kittens to make finding homes for them easier, although not all fanciers approve of this practice. Since the Manx gene is dominant, all Manx cats that possess the Manx gene will have one of the four types of tail. With all these variables, show-quality Manx cats are hard to come by. Even a Manx with a perfect tail is not necessarily a show cat. It must also have the proper body and head type, legs, ear set, and coat quality. General: The overall impression of the Manx is that of roundness. It should be surprisingly heavy when lifted. Body: Solidly muscled, compact, well-balanced, medium-sized with sturdy bone structure; stout appearance with broad chest; the repetition of curves and circles give the Manx the appearance of great substance and durability; powerful without a hint of coarseness; flank has greater depth than in other breeds; the short back forms a smooth, continuous arch from shoulders to rump, curving at rump to form desirable round look. Ears: Medium size; wide at base, tapering to rounded tip; widely spaced. Tail: Appearing absolute in perfect specimen; a rise of bone at the end of the spine is allowed unless it stops the judge’s hand. Coat: The double coat is short and dense with well-padded quality due to longer, open outer coat and closes cottony undercoat; texture of guard hairs somewhat hard; appearance is glossy; a softer coat may occur in whites and dilute colors.